The Port Hinchinbrook resort community in North Queensland is set to be transformed into a $450 million tourism drawcard. The Passage Holdings, an Australian company linked to American businessmen Lewis Cohen and Stephan Pinto, already has spent $4 million on improvements at the resort which was battered by Cyclone Yasi in 2011. The syndicate took possession of the resort and marina property last year and is preparing to settle on its $3 million purchase from liquidator FTI Consulting in coming weeks. The Passage Holdings has engaged renowned architects DBI Design to help realise its vision for the resort, which will be renamed Hinchinbrook Harbour and Resort and staged over 10 years. 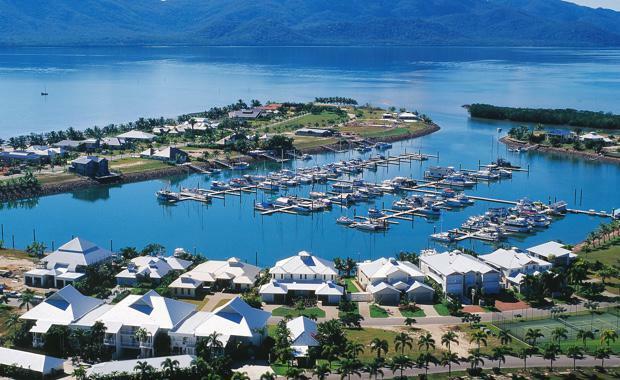 Mr Pinto said the $450 million masterplanned project offered the opportunity for Port Hinchinbrook to become one of Australia’s finest, safe-haven marina destinations with easy access to the Cassowary Coast fishing and boating paradise. It will capitalise on Far North Queensland’s appeal to a wide cross section of tourists, from international visitors and families to anglers and backpackers. DBI Design’s masterplan for the resort includes a $45 million international fishing village, new marina, family resort, water theme park, 300-site motorhome park, camp grounds, backpacker accommodation and waterfront residential lots and apartments. Mr Pinto said the syndicate’s $4 million initial investment included around $500,000 on restoring the sewerage treatment plant, more than $2 million on the grounds and marina village, commercial building, street lighting and public access, plus $750,000 on masterplan designs and consultation. The resort’s restaurant/retail precinct is due to reopen in mid-July following repairs, and work is poised to start on dredging the heavily silted harbour and the rebuilding of the 266-berth marina. The resort was first developed by the late Keith Williams adjacent to Hinchinbrook Island, near the historic village of Cardwell, during the 1990s. It fell into the hands of liquidators following the collapse of Williams Corporation in 2013. Mr Pinto, who has developed residential and commercial property in the US for 35 years, said he was amazed at the value and potential of the magnificent property. “I have been in real estate for a long time with experience in tourism assets worldwide - when I was informed about this project, I found it to be an interesting and compelling story,’’ he said. “Having experienced Hurricane Katrina and the effects it had on our properties in Texas, I knew there could be an opportunity for our investment group."